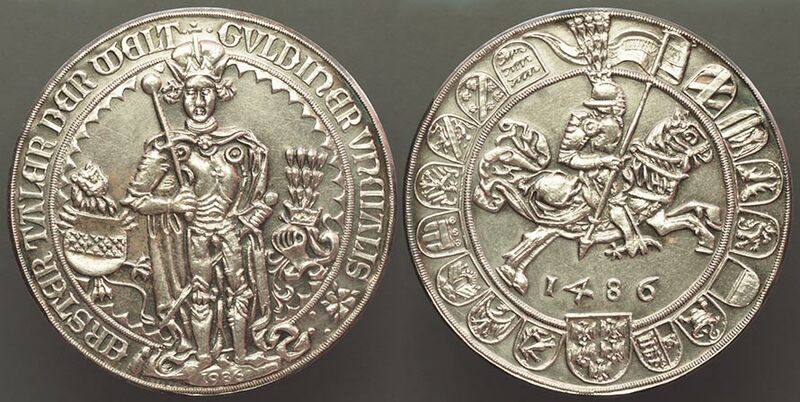 These are restrikes of the very famous Guldiner [60 Kreuzer] of 1486, the first silver dollar sized coin that started the crown sized coin craze. These eventually became known as Thalers [or Taler], are known in several denominational names over the succeeding centuries, mainly the dollar. This issue of 1986 celebrated 400 years since the Archduke of Austria, Sigismund [1427 - 1496] minted the first of these. Since there was a preceeding issue of about half-weight [30 Kreuzer] in 1484 there is some controversy of what qualifies as the first taler. While the 30 Kreuzer piece was a landmark large silver piece for the time, it was the Guldiner [aka. Guldengroschen] at 60 Kreuzer value that served as the model for crown sized silver coins. There's a large and interesting story about these coins which I hope to present here. So far I have not been able to show the original here. These were issued by the Hall mint in 5 different versions. The one shown here is the German/Latin version in antiqued finish. Other languages were English, French, Italian & Japanese. There was also a version in English struck on a 5 oz planchet. The original restrike idea was a product of 1953, an example of which is also in the Moneta Museum. Also, an issue of 2003 celebrates 700 Years of Hall, Tyrol with an incuse version imprinted as part of the coin. I have a complete set of all variations if you need photos please contact me.